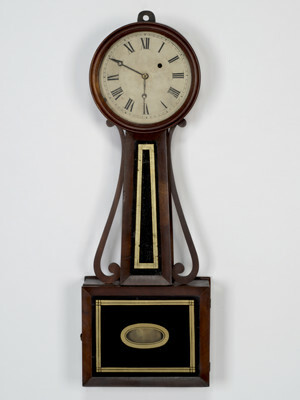 Tall Case Clock, 1766–1771. Benjamin Willard (1743–1803), Lexington, MA. Gift of Robert T. Dann in Memory of Dr. James R. and Constance D. Gallagher, 98.028a-g. Photograph by David Bohl. 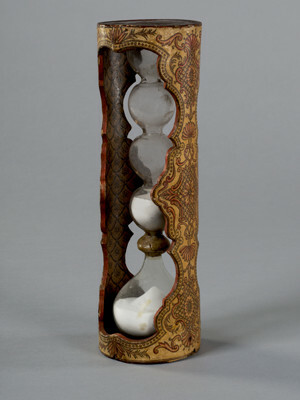 Hour Glass (Clepsammia), 1600s or 1700s. Italy. Gift of Mrs. Willis R. Michael, 85.108.20. Photograph by David Bohl. Banjo Wall Clock, ca. 1850. Horace Tifft (1804–1886), North Attleboro, MA. Gift of Mrs. Willis R. Michael, 82.53.20a-b. Photograph by David Bohl. “Keeping Time: Clockmakers and Collectors” features more than 50 clocks from the museum’s rich holdings—a part of the collection long popular with visitors. Each clock on view tells its own story about who used, made, sold or preserved it. Many of the clocks displayed in “Keeping Time” came to the Scottish Rite Masonic Museum & Library from the collection of Ruth and Willis Michael of York, Pennsylvania. Mr. Michael was a tool and die maker and entrepreneur who purchased his first clock in the late 1930s—a tall case clock crafted in the late 1700s by George Hoff of Lancaster, Pennsylvania. In Mr. Michael’s own words, that’s when he “got the bug.” His collection grew to include hundreds clocks, watches, automata and other clock related material. Colleagues in the antique clock world described Michael as “the dean of American Collectors.” After Mr. Michael died in 1969, Mrs. Michael began making a series of gifts from her husband’s collection to the Museum. She did so in honor of her husband’s lifelong involvement in Masonry. Mrs. Michaels’ gift of over 140 pieces from her husband’s collection forms the core of the Museum’s timepiece holdings. “Keeping Time” showcases the range of his interest in clocks featuring items as different as a large organ clock made in Germany in the 1800s to a paper-covered hour glass made in Italy in the 1600s. Using the material from the Michael collection as well as other items the Museum’s holds, the exhibition opens with an examination of the notion of time in Colonial days and shows the different ways people have told and valued time through the 1900s. The work and training of some of the skilled clockmakers who practiced the craft in the 1700s is also explored in “Keeping Time.” Makers required extensive knowledge of metals, mechanics and math to construct the works that allow clocks to operate. Collaborating with fellow craftsmen like cabinetmakers, engravers, and painters, the clockmaker assembled diverse elements to give his client a finished, working timepiece. “As an artist, he has exhibited as great a proof of mechanical genius as the world has ever produced,” said Thomas Jefferson of celebrated 1700s clockmaker David Rittenhouse of Philadelphia. 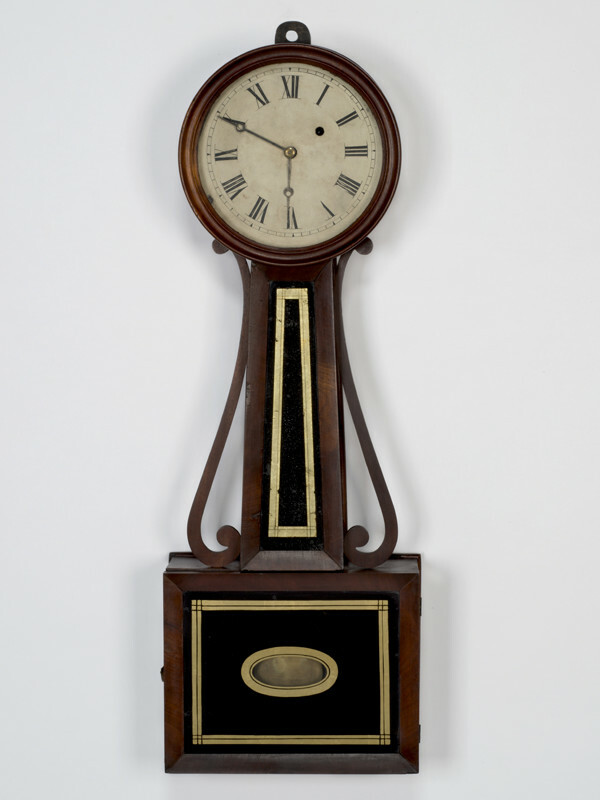 One of Rittenhouse’s tall case clocks is on view in the exhibition, along with several by New England makers such as Benjamin Willard, Jonathan Mulliken and Silas Hoadley. Starting in the early 1800s, innovative and entrepreneurial clockmakers shook up the clockmaking industry, creating new forms and more efficient means of manufacturing. Building on the technical and manufacturing advancements of the early 1800s, and fueled by consumers’ desire for clocks, by the 1850s, clockmakers created affordable, attractive, factory-made clocks for the public. Different makers hoped their merchandise would stand out in the crowd, so they manufactured and promoted clocks with attention-getting features such as musical alarms, stylish decoration, novelty shapes and specialized forms including banjo and candlestick clocks, examples of which are on view. As these innovations were taking place, some clockmakers continued to craft clocks one by one. Some of these clocks on view are whimsical ones by George McFadden. True folk art, the McFadden clocks are colorful timepieces that relay narratives like the Biblical story of Jonah and the Whale or Pinocchio. Other clocks on display in this section show ingenuity in how the makers employed their creativity to interest certain consumers, like parents or members of fraternal organizations. Taken together, the clocks, clockmakers, and collectors presented in “Keeping Time,” provide a glimpse into the rich history, innovation, and beauty of timepieces through the ages. Can’t wait to get to the Museum? Examples of clocks from the Michael collection are featured in on the Museum’s Flickr page. You can find the album here.